There are many benefits to choosing chain link fencing. It’s one of the most economical fencing types, and it has remained a favorite over the decades for its sturdy construction and how difficult it is to climb. Chain link fences are great for keeping people away from electrical units or out of certain areas. Some ranchers use chain link fences to demarcate boundary lines or to deter employees or guests from going where they shouldn’t. Long used for its versatility and strength, wood fences are perfect for use around larger animals. They are good for providing privacy and for keeping your animals from being distracted or spooked. There are a lot of options when it comes to wooden fences, and each variety has its own uses and benefits. Picket fencing is great for creating a property barrier that is easy to see. It can also be used to keep smaller animals in. Shadowbox fencing provides privacy without sacrificing airflow. Cedar split-rail fencing is often used on ranches to contain larger animals within a field. It is strong, but also appealing, and is often used for marking property lines. Those with horses and other livestock often use this type of fencing for its strength and good looks. Fences that combine both wood and iron have the benefits of both materials. They can be designed and crafted to your own specifications to give character and branding to your farm or ranch. The strength of the iron and the heft of the wood combine to create barriers that can keep others out as easily as they keep your animals in. For some farms and ranches, security is a priority. The security fence you choose will depend on the size of the area to be secured and what you’re trying to prevent — whether it’s escape, theft, unwanted visitors, or something else. A security fence is not something to skimp out on. When they’re made with high-quality materials and have warranties to protect them, security fences will give you peace of mind for years to come. The fences you choose will often become an important part of your business. They may change the way your employees get things done or restrict guests from entering certain areas. In addition, your fence and gate will make a big impression on those who see your property. They need to show your business partners that you’re on top of things and show your guests and neighbors that everything is properly secured. An impressive fence is a memorable part of your property, and it will become the backdrop of everything you do there. Often, a security fence along the edges of the property and a security gate at the front entrance will deter intruders. Inside the property, split-rail fences may be used to keep larger animals separated securely. In addition, there may be areas around the residence that need a privacy or picket fence and areas around the barn that will benefit from a chain link cage or fence. 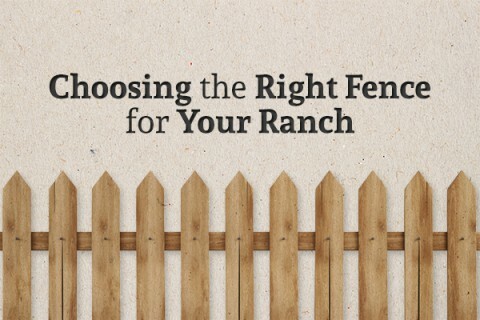 Only you know just how your farm or ranch works and how each area should be secured. By working with Rustic Fence to design the perfect system of fences, you can ensure that each area gets the right type of barrier and security.